Aladtec, Inc. provides cloud-based employee scheduling and workforce management solutions to dozens of EMS agencies across Wisconsin and North America -- including many PAAW members. River Falls-based Aladtec's first creation was a custom program, written for the Ellsworth (WI) Area Ambulance Service back in 2002. Soon, services in Baldwin and River Falls requested to use the server-based platform. Today, Aladtec serves more than 2,100 customers across the U.S. and Canada. The subscription-based program simplifies the process managers use to build complicated schedules. It uses e-mail and texting tools which allow employees to trade shifts, request time-off, and be notified of open shifts anywhere they have phone- or internet connectivity. The platform also allows agencies to build and host electronic forms to document daily station routines like ambulance drug inventories, apparatus equipment, and mechanical checks. Administrators can track staff members' licenses and certifications, upload files that members can access remotely, and send out text- and e-mail notifications to individuals or groups when the need arises to fill an open shift or staff a special event. It saves administrator time, creates transparency and improves internal communications, and helps streamline compliance tasks. PAAW members at Baraboo District Area Ambulance, Ryan Brothers Ambulance, Pardeeville EMS and many others use the online employee scheduling product every day. Call us, and we'd be pleased to provide references from agencies in your neighborhood. 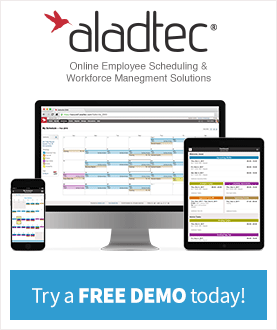 For more information about Aladtec and to experience a free demonstration, visit www.aladtec.com, or call 888-749-5550 and representative can arrange for a customized demo, tailored with your agency's unique scheduling and electronic form needs. "We have found Aladtec to be a great way to get messages and reminders to our EMTs. It also keeps our schedule and payroll up to date. This is a great product, and we would highly recommend it to all on-call services." View a Customer Profile in which Amery EMS Director Nicole Gullickson describes how Aladtec has streamlined tasks at her agency.